We have already mentioned that vesicles can bud from the ER, but where do the vesicles go? Before reaching their final destination, the lipids or proteins within the transport vesicles need to be sorted, packaged, and tagged so that they wind up in the right place. 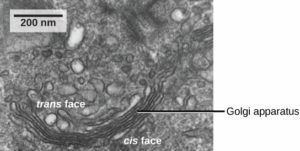 The sorting, tagging, packaging, and distribution of lipids and proteins take place in the Golgi apparatus (also called the Golgi body), a series of flattened membranous sacs (Figure 11).